A rare experience awaits those looking to relocate to the area around the San Ignacio Golf Club in Green Valley, Arizona. Rarely can a recreational facility of any kind be said to define the experience of living in a particular area. As part of Green Valley Recreation (a non-profit partnership of 13 recreation centers) the San Ignacio Golf Club does just that. The neighborhoods and partner facilities making up this exclusive, sporting community represent a quality of life often sought after, but rarely found. The name San Ignacio comes from the area’s history. Straddling I-19 about a half hour south of Tucson, Arizona, the land was originally part of the San Ignacio de la Canoa Land Grant, a gift from the King of Spain in 1820. In the 1960’s it earned the recognition and favor of many looking to retire from the East Coast. The area’s 25,000 year-round residents, most of whom are 55 or older who have already discovered the rich community life of San Ignacio, and for those looking to relocate, now, it’s your turn. Shopping and dining opportunities abound in and around the city of Green Valley. A great place to start would be Green Valley Village. More than a mall, Green Valley Village features not only retailers like Bon Worth Women’s Fashions and Ace Hardware, but also service providers such as attorney and dentist offices. Buy a book, have a spa treatment, make copies, order a bouquet of flowers, compare insurance rates, have an Italian dinner and you still haven’t explored everything this do-it-all location has to offer San Ignacio visitors and residents. Nearby, over 100 galleries and shops await in Tubac, a historic European settlement with its own museum and park. The neighborhoods immediately surrounding the San Ignacio Golf Club feature a number of available real estate listings and include San Ignacio Vistas I and II, San Ignacio Golf Estates, San Ignacio Ridge Estate sand San Ignacio Heights. Characterized primarily by free standing homes with walled-in back yards, the San Ignacio Vistas have a Home Owners Association (HOA) that maintains eight acres of Sonoran Desert inspired common area rocked and landscaped for residents’ enjoyment. Just behind the golf course, San Ignacio Heights boasts 15 acres of common area and use of a private ramada building on Mariquita Drive for community “Coffee Klatches” and other special events. A number of other neighborhoods including Canoa Ranch, Sunrise Pointe and Las Campanas share the benefits of membership in Green Valley Recreation and close proximity to the course which features stunning views of the Rincon and Santa Catalina mountain ranges. The San Ignacio Golf Club’s Arthur Mills designed course incorporates multi-level greens and use of the natural elevation changes to enhance the challenge facing the player at each hole. 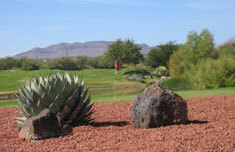 Membership includes privileges at nearby Canoa Hills Golf Club as well. The active, life-affirming vibe offered to San Ignacio area residents is a result of careful management of the surrounding communities and amenities. For one thing, all neighborhoods have home owners’ associations with age restrictions as part of their charters. In many cases, no permanent residents under the age of 18 are allowed and often, at least one home occupant must be at least 55. This guarantees a community where citizens can expect a certain level of maturity from their neighbors with all the advantages that mutual respect and solid life experience can bring to an area. In turn, San Ignacio offers its own unique experiences such as the chance to visit two nearby astronomy observatories Fred Lawrence Whipple/Mount Hopkins Observatory or the Kitt Peak Observatory, home to the largest telescope collection on Earth. If you’re thinking of moving to the San Ignacio area and want to check it out first, there’s no better place to stay than the Inn at San Ignacio right next to the Golf Club. Villa-inspired suites, an inviting pool and lots of other amenities await you, not to mention inclusive golf package deals and easy access to a number of area golf courses. Residents and visitors alike can take comfort in knowing that both the University Medical Center and the Carondelet Health Network are very close by and offer the best in preventative and emergency care. However, the almost-year-round sunshine of San Ignacio itself can do a lot to keep you at your healthiest. Boasting over 300 days per year of sunshine and an average temperature of 85 degrees, San Ignacio’s bounty is just waiting for you to claim your share.